Seventh pick Fierement claimed this year’s Kikuka Sho (Japanese St. Leger), the last leg of the Triple Crown, and captured his first graded victory in his only fourth career start, to become the the Kikuka Sho champion with the least career starts. The son of Deep Impact broke his maiden in his debut start just this January and marked another win in the following Yamafuji Sho (Allowance) in April. His first grade-race challenge in the following Radio Nikkei Sho (G3) in July resulted in a runner-up effort. All his past three races were raced over 1,800 meters. This win marked trainer Takahisa Tezuka’s fourth JRA-G1 win following the 2013 Asahi Hai Futurity Stakes with Asia Express. For jockey Christophe Lemaire, it was his 19th JRA-G1 title following his Shuka Sho victory with Almond Eye just a week ago and his second Kikuka Sho title following his win with Satono Diamond in 2016. Breaking smoothly from stall 12, Fierement traveled wide, settling around eighth from the front runner Generale Uno while Etario, breaking slowly from stall 9, steadily advanced forward in the first lap to position himself behind the subsequent winner. As the field of 18 crowded together rounding the last corners, Etario, under Mirco Demuro, took a wide turn and advanced to the front entering the homestretch while Fierement threaded through the horses and exerted a powerful late charge to catch up with the Stay Gold colt in the last 200 meters. The two colts dueled fiercely to the wire with Fierement claiming the race with a photo-finish win. “I had confidence in him as he felt good during the training. We briefly met traffic in the straight but my mount stretched really well with his bursting kick. I congratulated Mirco right after crossing the wire, thinking that we had lost, so it’s unbelievable that we were able to win the race,” commented Christophe Lemaire. You Can Smile hugged the rails inside Fierement at the stretch in the first lap, switched to the outside in the backstretch, positioning himself behind Fierement and inside Etario. Though briefly meeting traffic at the top of the stretch, the son of King Kamehameha found a clear path and surged out with Fierement in chase of Etario but weakened in the last 100 meters to finish 1-1/2 length behind in third. Race favorite Blast Onepiece traveled in mid-pack, switched to the outside at the backstretch, advanced through the outer route after the third corner and ran willingly but failed to threaten top three finishers, crossing the wire in fourth. T. Tezuka Sunday Racing Co., Ltd.
Y. Tomomichi G Riviere·Racing Co., Ltd.
M. Otake Silk Racing Co., Ltd.
T. Ozeki Silk Racing Co., Ltd.
K. Matsuda Sunday Racing Co., Ltd.
Y. Ikee Aoshiba Shoji Co., Ltd.
E. Yano G Riviere·Racing Co., Ltd.
K. Nonaka Kanayama Holdings Co., Ltd.
Y. Yahagi Shadai Race Horse Co., Ltd.
S. Kunieda Sunday Racing Co., Ltd. Owner: Kaneko Makoto Holdings Co., Ltd. Breeder: Kaneko Makoto Holdings Inc. The history of Kikuka Sho, the Japanese St. Leger and the last leg of the Triple Crown race for three-year-old colts and fillies, dates back to 1938—a year after Japan’s 11 racing clubs integrated into one organization named Nihon Keiba Kai (forerunner of the JRA). Initially called “Kyoto Norin-sho Shoten Yonsai Yobiuma Kyoso”, the race was renamed to Kikuka Sho in 1948. The race distance, however, has not changed since the first running, except in 1979 when the race was held at Hanshin Racecourse during Kyoto’s stand renovation. The Kikuka Sho features three-year-olds, most of who have grown dramatically since the Tokyo Yushun (Japanese Derby, G1, 2,400m) held five months before, prior to their summer break. 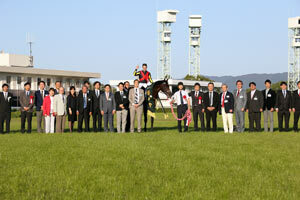 The Kikuka Sho winners have both the speed and the stamina to prove their caliber as the potential breeding stock. The last of the seven Triple Crown winners in JRA history was Orfevre (JPN, by Stay Gold) in 2011 who proceeded to prove his power against older G1 caliber in the Arima Kinen (G1, 2,500m), which led to his Horse of the Year that year. 2015 Kikuka Sho winner Kitasan Black (JPN, by Black Tide) and 2016 champion Satono Diamond (JPN, by Deep Impact) were chosen as the Horse of the Year and Best Three-Year-Old Colt, respectively, in 2016. This year’s line-up included runners coming off trial races, St. Lite Kinen (G2, 2,200m; Sep.17)—Generale Uno who claimed his second grade-race victory in the race, 2017 Kyoto Nisai Stakes (G3, 2,000m) winner Grail (3rd) and third-place Derby finisher Cosmic Force (7th)—and Kobe Shimbun Hai (G2, 2,400m; Sep.23)—runner-up Etario who was fourth in the Derby, Radio Nikkei Sho (G3, 1,800m; Jul.1) winner Meisho Tekkon (3rd), the Satsuki Sho victor Epoca d’Oro (4th), the 2018 Kyoto Shimbun Hai (G2, 2,200m) winner Stay Foolish (5th) and 2017 Hopeful Stakes (G1, 2,000m) champion Time Flyer (6th). The field also included the Radio Nikkei Sho runner-up Fierement, Shinanogawa Tokubetsu (Allowance, 2,000m; Aug.4) winner Grandiose and Blast Onepiece who won the Niigata Daishoten (G3, 2,000m; Sep.2) against senior rivals. Toho Jackal (JPN, by Special Week) renewed the race record and course record by 1.7 seconds to 3:01.0 seconds in 2014.